This instruction article explains how to prevent NiceLabel print jobs from changing or overwriting printer settings. 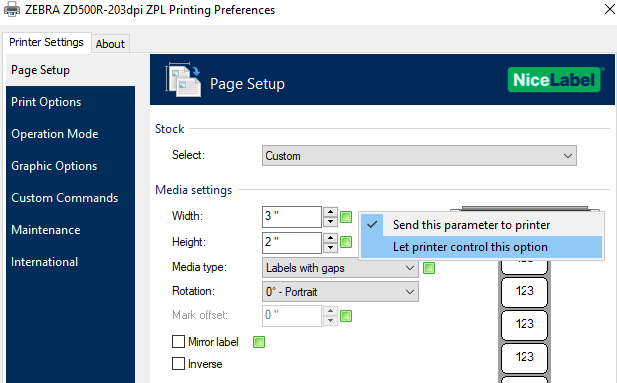 Under the Printer Settings function, select the Page Setup option on the left hand navigation. Then, look for the green check-boxes (those parameters can be controlled). After clicking on a checkbox, a pop-up menu appears. NiceLabel allows the user to control which printer settings get overwritten. The print user exercises this control on feature by feature basis using the printer driver. Thus NiceLabel does not save them within label design. Since they are not saved in the label file, they will not carry over when printing to a different printer.